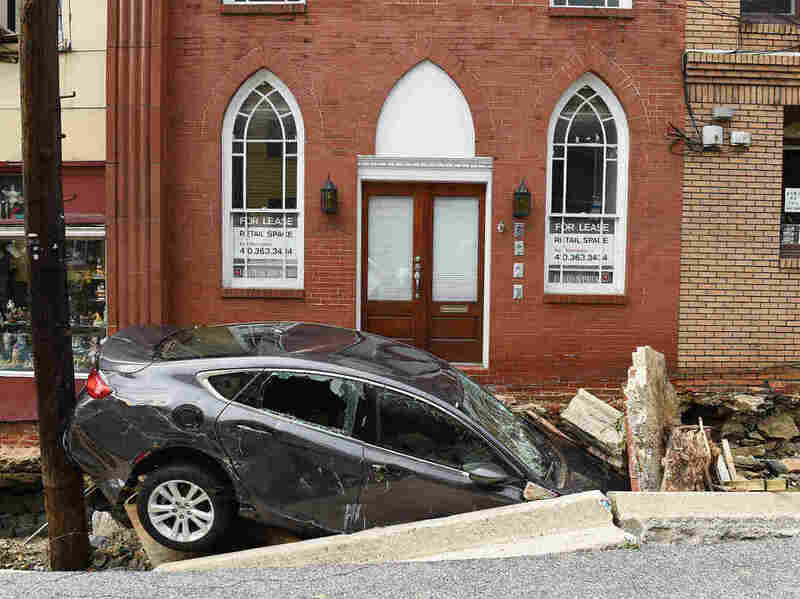 Maryland Town Begins Cleanup After Deadly Weekend Flooding : The Two-Way More than 6 inches of rain in less than three hours created a torrent that swept through downtown Ellicott City over the weekend. At least two people were killed. 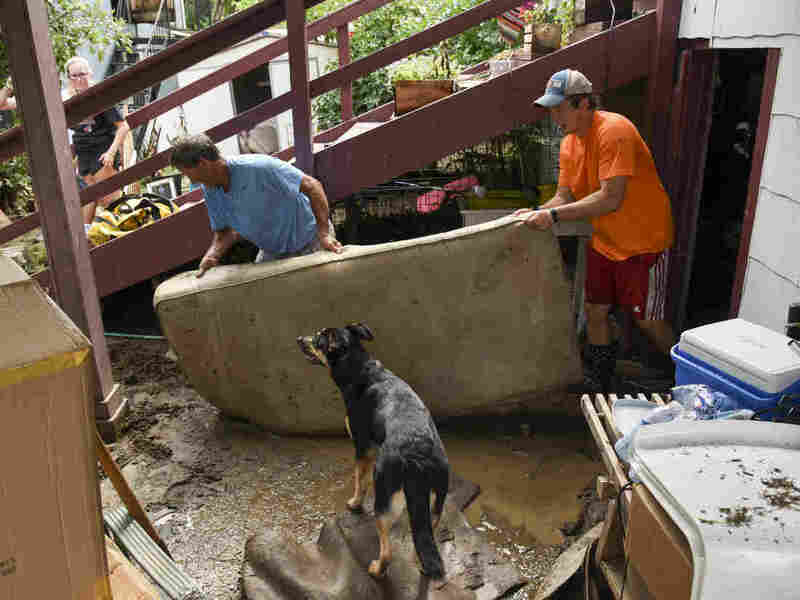 Rescue workers on Sunday look at the destruction caused by a flash flood on Main Street in Ellicott City, Md. "We thought we were gone," one resident told The Washington Post. 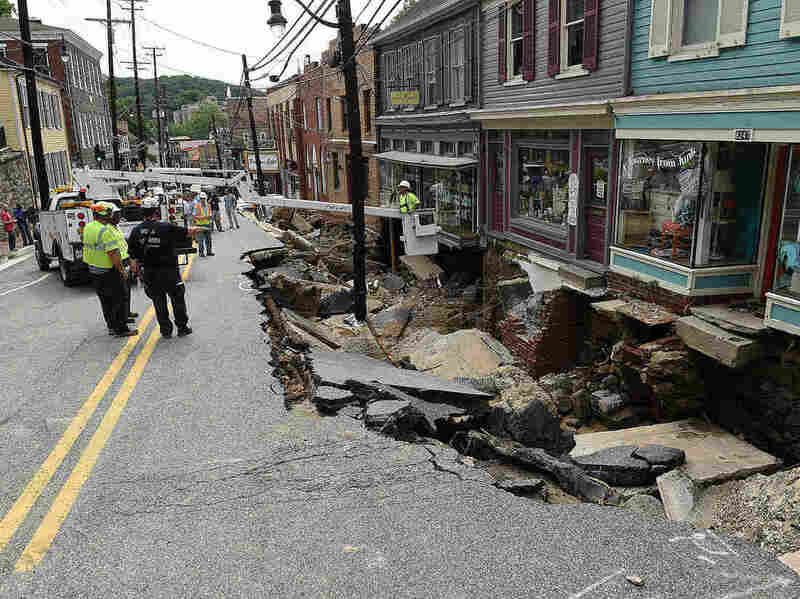 Kelly Secret's hometown of Ellicott City, Md., was torn apart by severe floods Saturday evening. More than 6 inches of rain in under three hours — a storm the National Weather Service says should happen only once every thousand years — turned the community's downtown into a muddy river. People rescued one another from cars being swept away. Hundreds of residents, including Secret, were trapped in their homes, waiting for police and firefighters to rescue them, the Post reports. When the water began to recede Sunday, at least 200 buildings had been damaged or destroyed. At least two people died: Jessica Watsula of Pennsylvania, and Joseph Anthony Blevins of Windsor Mill in Maryland, according to Baltimore County. Flooding along Main Street in Ellicott City upended cars, destroyed buildings and killed at least two people. Here, a car sits crushed under the rubble of a sidewalk downtown. Maryland Gov. Larry Hogan declared a state of emergency for the area and said that state emergency workers were responding immediately to help residents clean up and rebuild. The community sits on a county line, which runs down the still-flooded Patapsco River, making recovery efforts more complicated. Officials said in a statement that the Baltimore County Police Department's dive team was "in a recovery, rather than a rescue, mode" and would be working to get cars and other debris that had washed into the river. Al Miller (left) helps clear Dan Durantaye's flooded basement after heavy floods devastated the historic district of Ellicott City on Sunday. This is not the first flood to hit the community of about 65,000 people, which is at the confluence of multiple rivers and was founded in 1772. Many of the buildings downtown were first built in the 1800s. A local preservation organization has pledged its help with rebuilding historic structures damaged by water and mud, local news outlet WTOP reports.